I'm going to have to break from the social media world this morning, because all of the motivational Monday quotes and posts are just not doing it for me. I am exhausted, and quite frankly I'm pretty stuffed full of bitterness, sprinkled with dashes of lingering depression. Let me start this post by issuing an apology to those of you at Henderson Tap House, somewhere in the 8pm range. 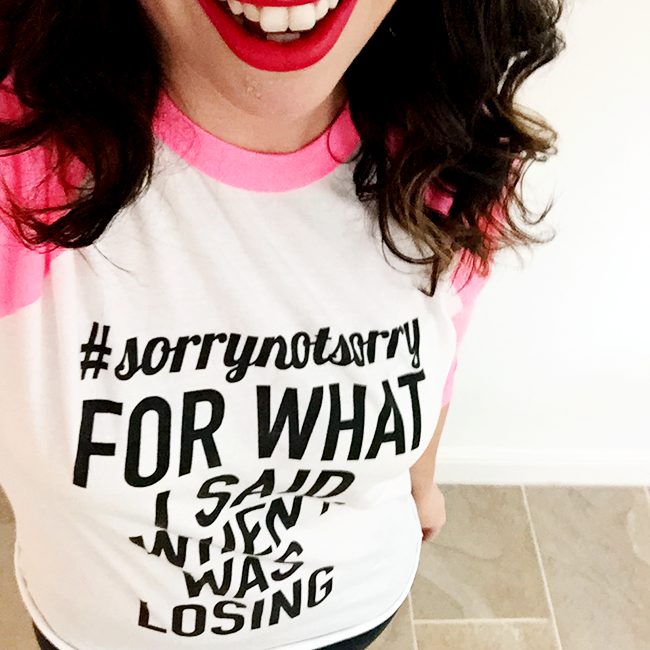 Please allow my shirt to apologize for the things I said when I was losing. Ok, I already feel a little bit better. Now I'll tell my story. We had plans to meet some friends and watch the Tennessee game on Saturday night. Originally, our plan was to stay home, drink some beers and watch it from the comfort of our own couch. When some Oklahoma friends asked if we wanted to watch it together, we jumped on that idea. "Homebody" isn't exactly a term you'd use to describe me, nor CB. The first place we stopped, hoping to find a table where we could watch the game, was called Clutch. Formally known as Prime Bar, USED TO BE a great spot to watch a game. To say I was underdressed in a t-shirt and converse would be a gigantic understatement. 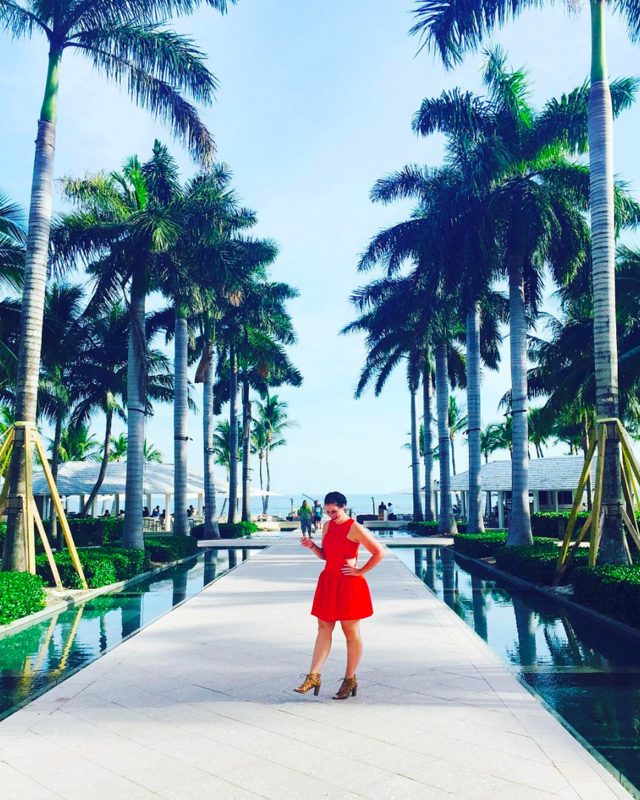 If you had told me that I had teleported to Saturday night at 1am in South Beach, I would have believed you. Not to mention they were using one of their 4 TVs to broadcast the Yankees vs Blue Jays baseball game.... ON A FALL SATURDAY AFTERNOON. We bailed. Totally confirming my thoughts that sports bars are dead. We then proceeded to roam all over Dallas looking for a place to watch the game. We tried to go check out a few others bars nearby. The next place, Oklahoma State watch party, all TVs will be playing that game. The next place, Notre Dame watch party, all TVs will be playing that game. The next place, Ole Miss watch party, all TVs will be playing that game. So, where do we end up to watch the game? At the official Oklahoma Sooners Dallas Alum watch party. It was the only place we could find that had the game and sound on every single TV. Wow, did I feel uncomfortable. As a general rule of thumb, if you aren't rooting for the same team as I am, it's probably not in your best interest to watch the game with me. Saying I'm obnoxious is really putting it mildly. So here I am, an orange shirt stranded in a sea of red. CB, bless his little heart, wanted to support me and the Vols by wearing the Texas shirt I made him last year. Yes, he is a fan of that other UT. 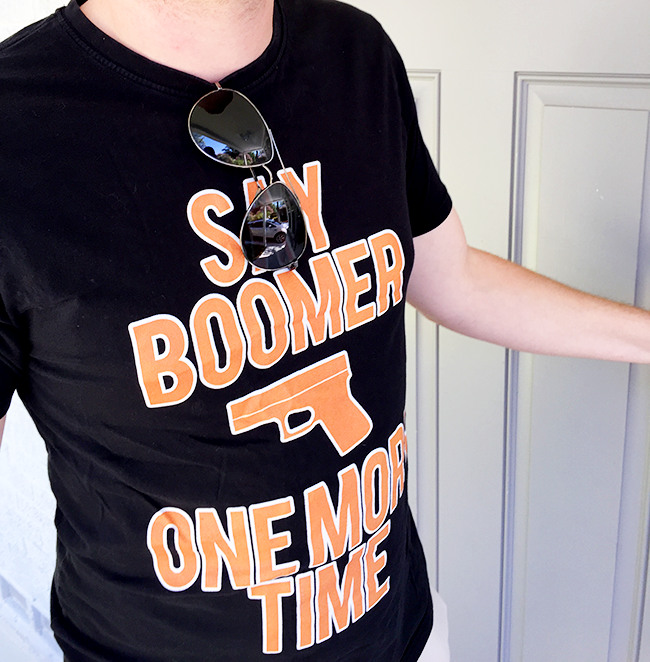 He wore that shirt, to an Oklahoma Sooners ALUM watch party, to support me. Oopsies! Oddly enough, he got far more compliments than dirty looks. One guy even offered to buy him a shot for having the balls to wear that at an OU party! 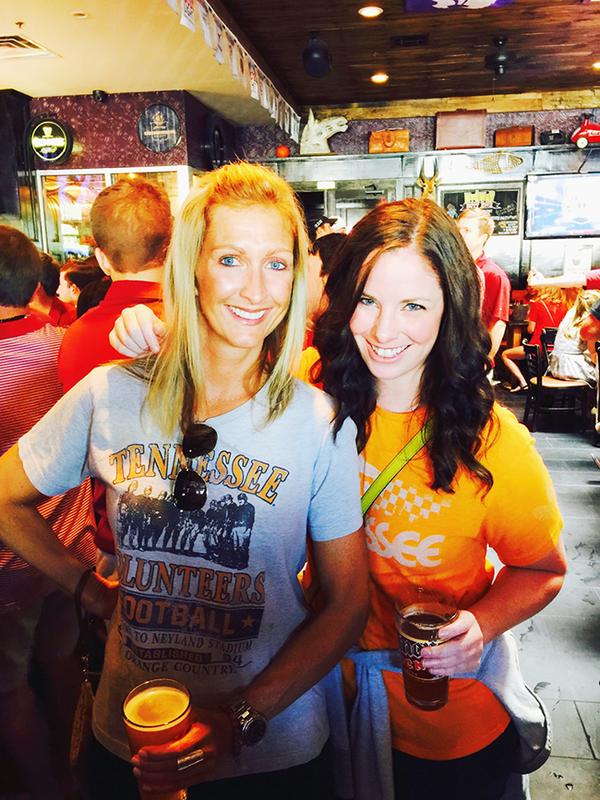 My friend Larissa even borrowed a Tennessee shirt to show her support. Needless to say, we might have had a beer, or seven, as soon as we arrived. It made the horrific Tennessee meltdown a little easier to take. Thank you CB and Larissa for being such good sports, I won't force you to root for Tennessee again. Also this last sentence is more than likely untrue. I'll meet you guys next weekend at wherever the Western Carolina watch party is in Dallas. Let's just rain on everyone's alumni watch party parade! my friend was at the same bar. I saw her snapchats of her screaming when Oklahoma won, so I can only feel your pain. Sorry for your loss, I'll send flowers. At least you and CB look cute! I can't even handle that game on Saturday. My heart still hurts. Ohhh Sarah..,.. what a game. I'll try not to rub it in... Sooners obviously have some work to do too.... but how bout them Cowboys?!?! Sheesh. What a football weekend. I was getting ready to put Chris's daughter to bed last night when Chris yelled from the other room that Dallas had the ball on the 32-yard line. I abandoned the kid and ran out to see the final drive, thinking of you the whole time. And the fact that Dallas just got me some more points on my pick 'em bracket. Bless y'all! Seriously. There is only one team we will cheer against in the Big 12 - The Oklahoma effing Sooners. We wanted y'all to win so badly! That was definitely a tough loss. I was rooting for you guys! Sounds like you had fun though! I can't talk about it either. I was quite literally laying spread eagle in the middle of my living room by the end. My mom even called to "check on me." The call went like this: Mom: "Sarah, are you okay?" Me: "The fact that there is still wine left is a testament to how much wine we had in the first place." Mom: "You aren't going anywhere tonight, right?" Sigh. That was a heartbreaking loss. I always tell people we watch football games with that I can't be held responsible for what comes out of my mouth during a game. I can't even talk about what is happening in our fantasy game right now. I'm horrified and on the verge of angry tears. They are a thing. Also my team plays tonight at 10:20 on the east coast and I have to bring J to the airport at 4 AM. Week one is not my week. Eff.